In West Africa, natural regeneration of oil palms (Elaeis guineensis Jacq.) can be favoured by agricultural practices. The structure of palm groves may thus reflect the history of land use. 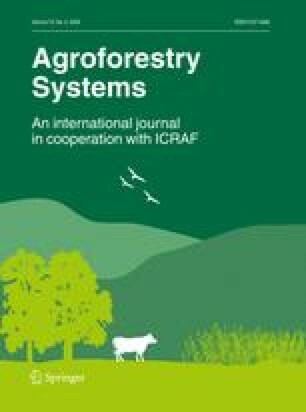 In this study, we examined the connection between biophysical factors, land use and the structure and dynamics of semi-wild palm groves in the village of Nienh, in the forest region of Guinea (Forest Guinea), in order to determine to what extent semi-wild palm groves could be considered as an ecological indicator of the history of regional landscapes. Grove management strategies of farmers were also determined and related to farm characteristics. In Nienh, semi-wild palm groves were found in three cropping systems with differing characteristics in each. Palms were scarce in lowland agricultural areas (8 palms ha−1), while they were significantly taller (15.8 m on average) and less dense (36 palms ha−1) in agroforests than in slash-and-burn cropping systems (9.4 m and 55 palms ha−1 respectively). Interviews with farmers showed that it was possible for a farmer to have a global strategy of semi-wild palm grove densification combined with oil palm elimination on a plot scale. The lack of regeneration of palms in agroforests resulted from the almost systematic elimination of young palms by farmers. Conversely, in slash-and-burn cropping systems, young palms were often preserved. As the structure of semi-wild palm groves was partly explained by agricultural practices, it could be used as an ecological indicator of changes in practice in relation to socio-economic context. We thank the French Ministry of Foreign Affairs for financial support through the Fonds de Solidarité Prioritaire project 2003-015. We are grateful to A. Camara and K.K. Zoumanigui from the Institut de Recherche Agronomique de Guinée. We greatly appreciate the help of numerous farmers from Nienh for granting access to their fields and providing information, and the help of J. Théa and F.C. Kolié for surveys.